Welcome to Huygens' GCMS page! Welcome to Huygens' Gas Chromatograph Mass Spectrometer (GCMS) page! The Cassini-Huygens mission is an international scientific collaboration, involving over 5,000 people from 17 different countries. The mission is comprised of two parts: the Cassini spacecraft and the Huygens probe. The Cassini spacecraft was assembled by National Aeronautics and Space Administration's Jet Propulsion Laboratory (NASA JPL). Cassini was built to orbit and study the planet Saturn. The Huygens probe was assembled by the European Space Agency (ESA) to explore the atmosphere and surface of Saturn's largest known moon,Titan. The Cassini spacecraft and Huygens probe were launched at 4:43 a.m. EDT, on October 15, 1997, by a Titan IVB/Centaur rocket. Cassini-Huygens entered Saturn's orbit in July of 2004. At that time, Cassini began its 4-year mission of collecting data about Saturn, its rings, and its 30 known moons. On December 24, 2004 (US Eastern Time) Cassini deployed the Huygens probe. The probe descended into the depths of Titan's atmosphere on January 14, 2005, where it was expected to conduct a 2 to 3 hour long mission. The atmosphere entry phase of the mission lasted 147 minutes. The probe continued operations on the surface of Titan and returned data to the Cassini Orbiter for an additional 71 minutes at which time the orbiter moved over the horizon and lost contact with the probe. Other reports indicate that the probe lasted at least 3 hours on the ground. The Cassini Orbiter instruments continue to return excellent data and the mission has been extended. Among the many instruments aboard the Huygens probe is the GCMS, which was developed by NASA Goddard Space Flight Center's Planetary Environments Laboratory. The GCMS will be used to study the chemical composition, origin, and evolution of Titan's atmosphere. Titan (pictured on the right) is of interest to space scientists because it is one of the only other places in the solar system that has a dense atmosphere. 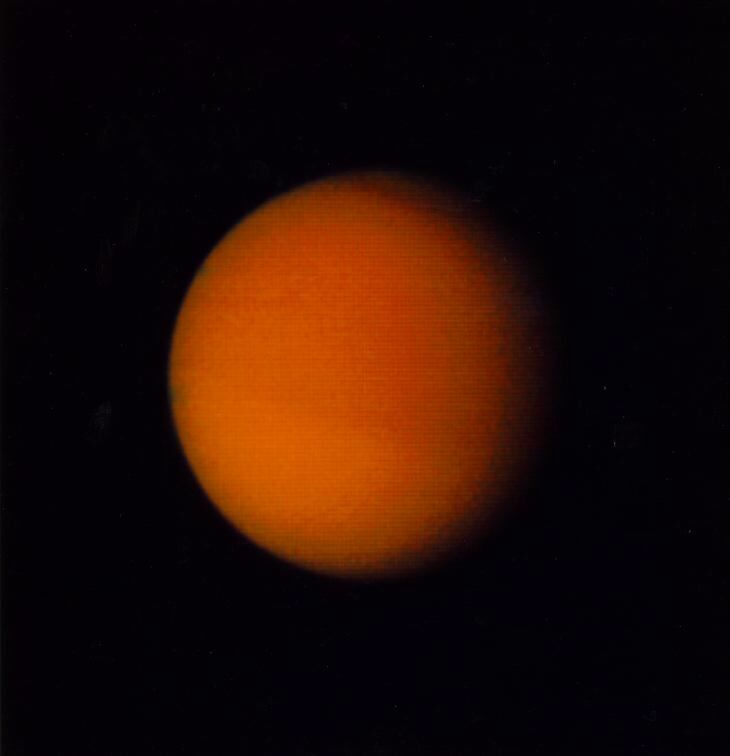 Titan's hazy, orange atmosphere is nitrogen-rich and contains organic (carbon-based) molecules. Its surface is thought to be covered with oceans of ethane and methane. Since the conditions on Titan are similar to the conditions on Earth before life began, one of the main reasons for studying Titan's atmosphere is that it can help scientists understand how life evolved on Earth. Surprisingly, although the GCMS is a sophisticated and powerful instrument, the scientific ideas the instrument utilizes are relatively simple. This webpage primarily provides a basic explanation of the science behind Huygens' GCMS, but there are also links and information on the Cassini-Huygens mission, Saturn, and Titan.